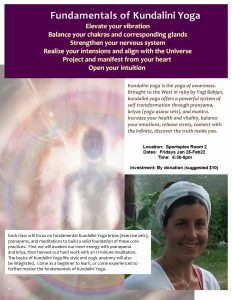 Come learn the fundamentals of the ancient and transformative yogic science brought to the West by Yogi Bhajan. This 75-90 min class will consist of breath work called pranayam; yogic exercise sets known as kriyas; and meditation. It will be offered Friday evenings in February from 6:30pm-8pm at the Sportsplex in Room2. Come increase your health and vitality, balance your emotions, release stress, connect with the infinite, and discover the truth inside you.